Every year, Blue Sargent stands next to her clairvoyant mother as the soon-to-be dead walk past. Blue never sees them--until this year, when a boy emerges from the dark and speaks to her. But Blue is drawn to Gansey, in a way she can't entirely explain. He is on a quest that has encompassed three other Raven Boys: Adam, the scholarship student who resents the privilege around him; Ronan, the fierce soul whose emotions range from anger to despair; and Noah, the taciturn watcher who notices many things but says very little. For as long as she can remember, Blue has been warned that she will cause her true love to die. She doesn't believe in true love, and never thought this would be a problem. But as her life becomes caught up in the strange and sinister world of the Raven Boys, she's not so sure anymore. Maggie Stiefvater is the #1 New York Times bestselling author of the novels Shiver, Linger, Forever, and Sinner. Her novel The Scorpio Races was named a Michael L. Printz Honor Book by the American Library Association. 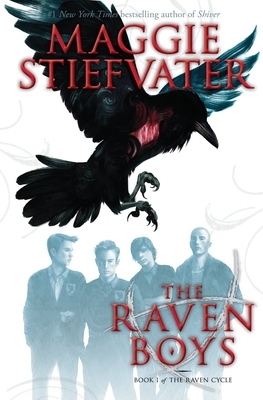 The first book in The Raven Cycle, The Raven Boys, was a Publishers Weekly Best Book of the Year and the second book, The Dream Thieves, was an ALA Best Book for Young Adults. The third book, Blue Lily, Lily Blue, received five starred reviews. The final book, The Raven King, received four. Her latest book is All the Crooked Saints. She is also an artist and musician. She lives in Virginia with her husband and their two children. You can visit her online at maggiestiefvater.com.